If you’re drawn to the dark beauty of granite and the soft veining of marble, then you’ll love soapstone. This metamorphic rock is formed mainly from talc, a mineral rich in magnesium. Its chemical composition makes it durable and decently low on the maintenance scale all while exuding an elegant old-world aesthetic. Its variation tends to softer than marble’s distinct vein and background structure, more like flowing sand. 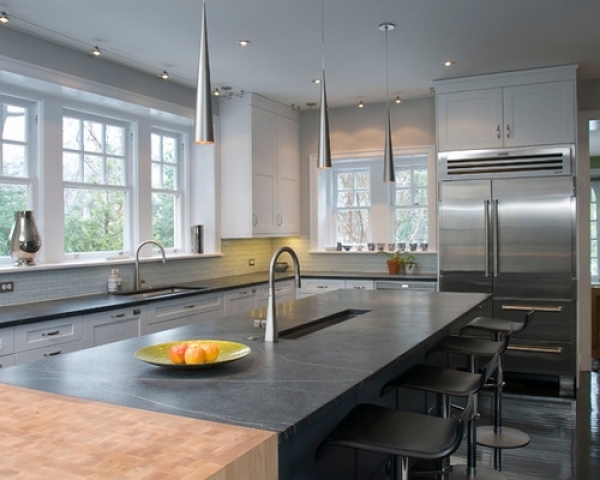 Let’s dig into soapstone so you can discover whether or not it’s the right choice for you. Let’s start with shock and awe. Soapstone is very stain resistant (OOOH, AHHH). Although, with natural use it does darken. Its chemical structure is inert (meaning chemically inactive), therefore, it doesn’t react negatively to acids and acid cleaners. This makes it a superior kitchen surface to marble which can etch when exposed to citreous fruits and tomatoes, as well as a variety of acidic drinks including soda, coffee and tea…or just about anything you like. Because this stone is inert, chemicals, acids, and heat won’t harm it. Yes, that means a hot pan placed directly onto soapstone won’t damage this surface. Recall that while pure granite offers similar performance, however many granites only reach the market if they have been resonated (saturated) with a polyester resin to improve its flexibility, otherwise it would be too brittle to survive shipping. The granite is heat resistant but the polyester resin can char white on exposure to heat. (Bet you didn’t know that little fact). Not the case with Soapstone. Making cleaning very low-stress. 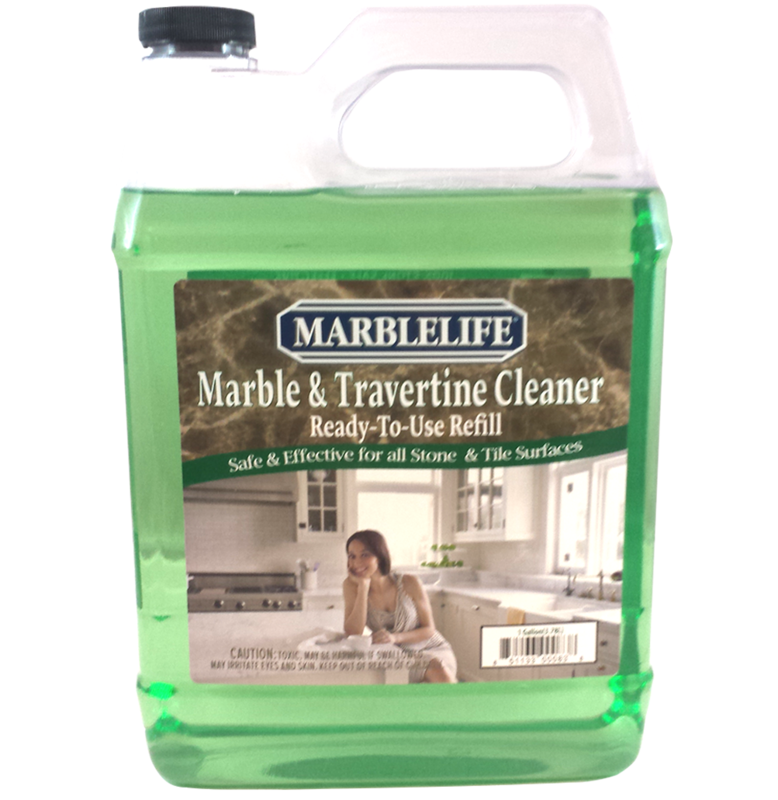 Just use a stone-safe cleaner like MARBLELIFE® Marble & Travertine InterCare Cleaner with a microfiber towel or cloth to wipe up spills or drippings. Or save more by bundling with our MARBLELIFE® Marble Counter & Table Top Clean & Care Kit. While its stain-resistant designation makes soapstone a desirable option for surfaces such as countertops, it comes with a small trade-off. This stone is much softer than granite and marble. Making it more prone to scratches. Light scratches can be treated and removed with sandpaper and mineral oil (best done by a professional, as many of our soapstone jobs have started with a small scratch and evolved into an entire surface project after a little sand paper in the wrong hands – but technically accurate). Deeper scratches will require more in-depth sanding. Because of the soft nature of this stone, it has a tendency to dent rather than chip or crack. The deeper the damage the more you are going to need a professional who will need to not just remove the damage but re-level the surface – least we want a new soapdish around the formally damaged area. That likely sounds scrarier than it really is, but we can tell you stories. Pro Tip: Sanding removes any previously applied mineral oil. After sanding a scratch, re-apply mineral oil and keep in mind it may take several coats for the spot to reach its final color and match the rest of the surface. Using mineral oil with your soapstone is a big part of its care. The oil serves as a thin moisture layer used to speed up stone oxidation. If you’d like to darken the appearance of your soapstone, simply apply some mineral oil. Because soapstone is non-porous, the mineral oil will eventually evaporate and need to be replenished. The frequency of this depends on the relative use of the surface, but usually once a month or so is standard. Given that you want your cleaner to remove cooking oils when you clean, the very act of cleaning will remove these oils. As such, soapstone does require some babying. Pro Tip: When water begins to leave noticeable dark spots on your soapstone, it’s time to re-oil. This is because the surface is no longer oil filled and allows the water to penetrate. your local MARBLELIFE office and a knowledgeable stone craftsman will be happy to assist you in any way they can.